Shrinking Kitchen // Breakfast // Best Green Smoothie Ever! This was originally run in 2012, but with the start of the new year, it’s worth revisiting! I had one this morning and I have so much energy – all from natural sources! Enjoy. I’ve been drinking green stuff for ages. My mom was a big juicer when I was growing up, and we used to frequent Whole Foods for wheat grass shots 20 years ago – WAY before it was trendy. Needless to say, I have a thing for the green. For some people, green = gross, but honestly, there are so many wonderful ways to make green = GREAT! 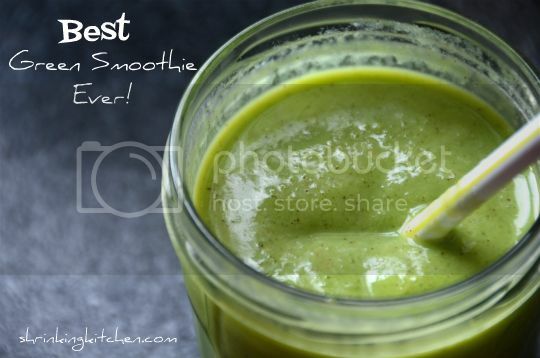 Allow me to introduce you to the Best Green Smoothie Ever! This green smoothie recipe is one I’ve been working on for awhile. The secret ingredient is avocado. Yeah, it might sound a little odd, but trust me, okay? The avocado lends a smooth creaminess that you just can’t achieve any other way, and it gives you so much beneficial fat, which will keep you feeling full longer. All the other things make this smoothie a vitamin powerhouse – exactly what you need for the holiday season full of shopping, and staying up late, and to help make you feel better after all those indulgences. It cures hangovers, too. Okay, maybe that last bit isn’t proven, but it will make you feel better after a night of over-imbibing. So go ahead, give it a try! If you are missing any of the ingredients, feel free to sub. You can use regular milk in place of almond milk; honey in place of Truvia, and any other fruit you like! This smoothie is packed with goodness that will give you lasting energy and a pep in your step! Sub in whatever fruit you have on hand instead of pineapple! Kale can be used in place of spinach. Don't leave out the avocado because it lends a decadently creamy texture. Place first 6 ingredients in your blender and mix until very smooth. Add ice cubes last, so the smoothie will be extra chilly! Do you have a secret ingredient for your smoothies? Care to share? Thirty-nine year-old wife and mom to BJ (11) and Mia (7). I'm the editor at the Sisterhood, and I really love to run (really), read, cook amazing things, and photography is my fledging passion. My motivation is motivating other people to realize they can do this whole weight-loss and exercise thing. I'm living proof!